In a typically eloquent post a few months back, fellow food blogger Silverbrow confessed to what he called his "Dirty Secret" - the use of the Square Meal restaurant review site. I know how he feels - as a foodie there seems to be an attitude that you should just somehow know where's good and where isn't from tips handed down from the Food Gods, rather than doing anything so common as looking it up on a website. For whatever reason, to say you visited somewhere because a friend recommended it is perfectly fine, even if said friend knows nothing about food, but to say you'd made a booking based on the highest score on TrustedPlaces is inviting ridicule. It's absurd, of course, but such is the elitist world of restaurant dining. So perhaps now it's time to confess to my own dirty secret. In the same way that some people obsessively track their eBay collectibles or their Facebook feed, I am addicted to the Toptable Special Offers page. It's constantly updated, includes some of the best restaurants in the country and occasionally lists offers that seem too good to be true. Recently, Michelin-starred Knightsbridge eatery One-O-One had a "50% off the food" offer - astonishing when you consider the quality of the cooking there and that this included all a la carte menu items with ingredients such as lobster, truffles and caviar. And on Monday, searching for somewhere new to visit that evening I spotted a similar deal at The Clerkenwell - a restaurant with a stellar pedigree and yet one which has quite a low profile in the capital. With a couple of clicks, I made a booking. The one thing that does let Toptable down is the user reviews - sometimes it's hard to believe you're eating on the same planet of some of the more eccentric reviewers, never mind the same restaurant. I had been led to expect poor service ("we had a clumsy waiter"), and yet service on the night was never anything less than charming and super-efficient. The room was intimate without being oppressive ("tables are too close together"), and I liked the long entrance corridor with the uplighting and plush carpet ("hallway carpet really needs to be replaced"). I also enjoyed a glass of white burgundy in the bar area without being rushed to my table ("the minute a glass or plate was left unattended it would be wisked[sic] away by a waiter keen to get us out of there and get the table back"). The food wasn't a letdown either. An unlisted amuse of parsnip soup was pleasant and set the tone nicely, but the fireworks really started with the arrival of my Steak Tartare and Truffle Cream. 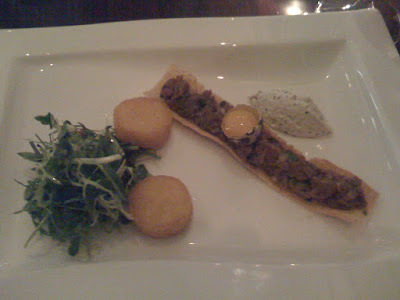 The steak itself was served on a cigar-shaped sliver of polenta crisp, topped with a cute quails egg yolk in a half shell. 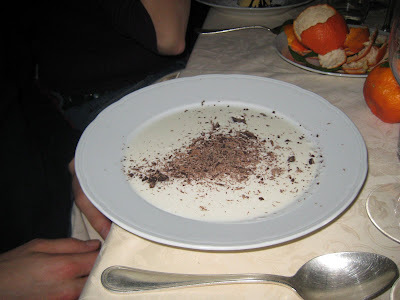 With it were two medallions of polenta which had great texture and were only slightly too oily, and a superb dollop of earthy, truffley mousse. Main course was a very fresh fillet of wild sea bass, with good firm flesh and lovely crispy skin, sat on top of a potato rösti. Surrounding it was a warm and silky crab sauce spiked with some mixture of herbs that I couldn't quite place but which had great, fresh flavour. Again, the only mild complaint was the rösti which could have done with losing about 50% of its oil content, but it did its job well enough. 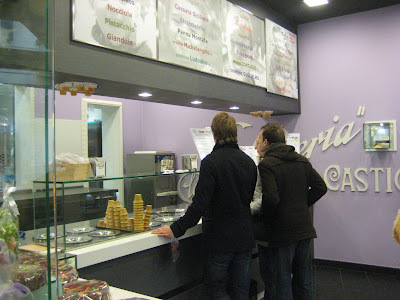 Finally, we shared a chocolate tarte thingy and white chocolate ice-cream. 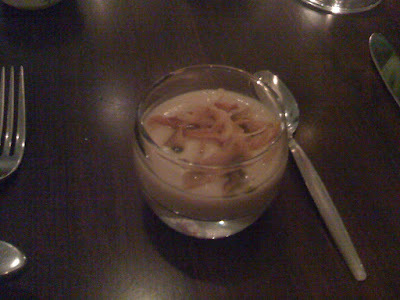 As is so often the case in these places, desserts seemed like a bit of an afterthought - I don't have much of a sweet tooth but I could tell the ingredients and preparation in the dessert menu was toned down in comparison to the savoury courses. 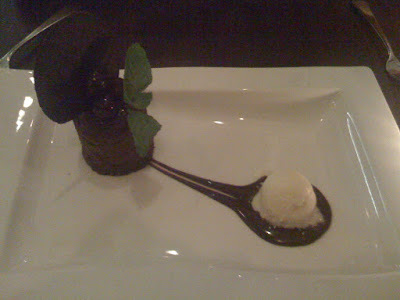 The chocolate itself was bordering on stodgy and was hard to get through, even with two of us attacking it, although the white chocolate ice-cream was good. 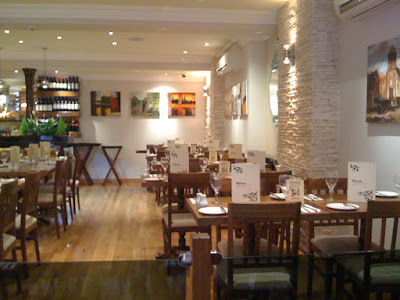 Overall I was very pleasantly surprised with The Clerkenwell. The kitchen showed a confidence not to muck about too much with good ingredients, and perhaps with a slightly lighter touch on the fried goods they would be worthy of attention from the Michelin boys. Is it possible that all the weird reviews from Toptable were just a clever exercise in lowering expectations so the reality would be appreciated in sharper relief? If so, it certainly worked on me. And now my dirty secret is out, I commend the Toptable Special Offers page to you - just remember, whatever the user reviews say, the opposite may well be true. I have an instinctive reaction against anything mass-produced or corporate. 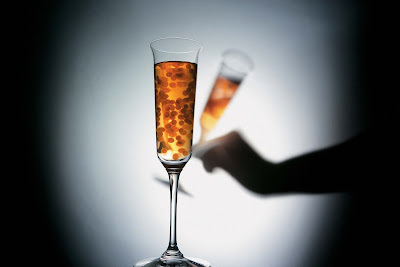 It is, I fully admit, largely snobbery, but it's also a case of familiarity breeding contempt - I get bored of seeing the same row of bland high-street spirits behind every bar in London, or the same menus and bloody curly fries on every pub menu, and I'm cursed with a voracious foodie appetite for the new. There are, of course, some mass-market products that I will happily recommend. That Nando's Piri Piri sauce, for example, always has a place in my food cupboard even if the chicken and chips at their restaurants is less than great, and I couldn't call myself a proud Englishman if I didn't enjoy a Heinz beans on toast every once in a while. But usually I will go out of my way to avoid "brands" and will rebel against corporate homogeneity even if it means traipsing hours out of my way or (more usually) spending far more than is sensible. Perhaps what I really admire in a product is honesty - take, for example, rum. Havana Club Rum 3yr is an old favourite, and I happen to think it tastes lovely. I also happen to know that it is still made in Cuba and although these days you see it in more and more places in the UK it doesn't seem to have affected the taste. Bacardi, on the other hand, which is quite bland in comparison (even the slightly aged golden version hasn't got much going for it) hasn't been a genuine Cuban brand since shortly after the revolution in 1959 and is in fact now produced in Mexico. This despite the grossly misleading advertising campaign and the text "company founded in Santiago de Cuba in 1862" on every bottle. I don't know why I prefer Havana Club only because it tastes better or also because I know I'm not being lied to. Maybe it's an insecurity thing. 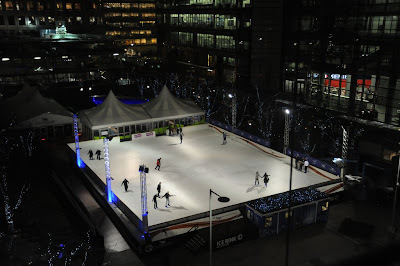 Given my issues with international drinks brands, I was therefore rather apprehensive on being invited to a Smirnoff cocktail evening in Canary Wharf a fortnight ago. 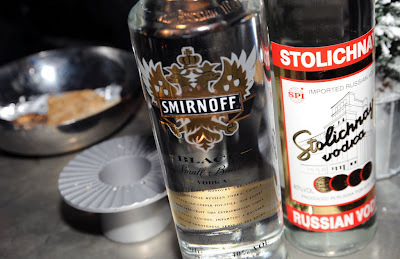 Smirnoff, stalwart of every pub and bar in Britain, mass-produced in staggering numbers by evil giant corporation Diageo, is not a vodka I would ordinarily go out of my way to drink, to put it mildly. But this evening was about Smirnoff Black, a small batch vodka produced in copper stills and therefore taking on an interesting, minerally flavour. Mixing the drink into some rather tasty and interesting cocktails was Tristan Stephenson, who also writes a very comprehensive drinks blog and seemed to really know his stuff. 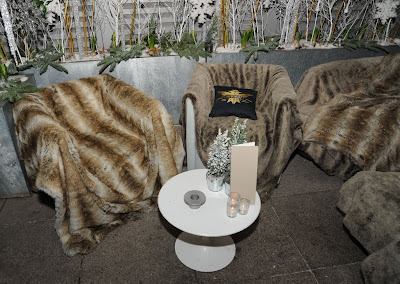 It was a lovely evening, but I defy anyone to not have a good time in a room decorated with fake snow and fur-covered furniture with views over the Canary Wharf ice rink and being served premium vodka. Smirnoff Black does genuinely taste better than its cheaper cousin Smirnoff Red, but that shouldn't be a surprise - the production process is more careful and controlled and the end product more refined - and more expensive. There's a part of me that thinks that maybe it's about time I revisited my prejudices and started trying to appreciate food and drink without worrying about some vague notion of authenticity and heritage. Authenticity is important - but authenticity of purpose, honesty of intent. It doesn't matter which faceless corporation is financing the deal as long as someone with enough knowledge, skills and passion has responsibility for the stuff that reaches the shelves. This vital link between supplier and consumer is the single common factor across all good products, whether it's bottles of vodka or prize-winning cabbages or restaurant meals. Keep an eye out for Smirnoff Black, you may be pleasantly surprised. As for me, I'm off to buy a Big Mac. 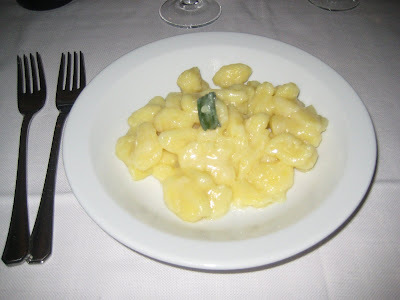 As should be clear from my last couple of posts, we avoided any multiple Michelin-star high-end meals in Bologna. I'd like to tell you that was due to my uncompromising search for authenticity and deliberate rejection of the homogenised, ratings-chasing international dining scene, but in all honesty, the reasons we ended up in local Trattoria, good though they were, is largely due to one thing - that bloody exchange rate. The world economy has been tanking for the best part of a year, the unemployment rate has skyrocketed and the entire financial system is dangerously close to collapse, and yet I would have happily ignored the whole thing had my trips to Europe suddenly not become 30% more expensive. Very irritating, although I suppose there is one benefit - at a rate of £1 = €1, it's very easy to work out how much things cost. Anyway, the reason I bang on about the exchange rate is that having imagined Emilia-Romagna as some kind of rustic gastronomic utopia where merry farmers' wives sold their unpasteurised homemade cheese for half a cent and a handful of buttons, and €5 would get you a meal for four and a cab ride home, the reality of eating and drinking out in Bologna, which is after all a wealthy, major European city with its Prada and Gucci stores and well-heeled residents in fur coats, came as a bit of a shock to the wallet. I didn't begrudge at all paying £35 a head in della Rosa because the food was excellent and the service a delight, but the next day we naïvely wandered into a café on the Piazza Galvini called Zanarini which charged - and I promise this is the menu price, without service - €7.50 for a cup of tea. They also did a milkshake for €10. Quentin Tarantino would not be impressed. Having said all that, my philosophy when it comes to food and drink, repeated many times on this site, has always been "you get what you pay for". There are the odd exceptions to this rule, such as Tayyabs at one extreme and Zanarini at the other, but in the main, good food costs more than bad food, and the real issue is value. If I think I'm getting my money's worth then I will shell out quite happily, but if I think that an establishment is cynically attempting to fleece naive tourists who had been shown to a table in the only place in the entire city open on a Sunday before they'd really had a chance to check out the prices on the menu (I blame myself really), then that will leave a bad taste in my mouth. And I'm not just talking about the contents of their tortelloni. 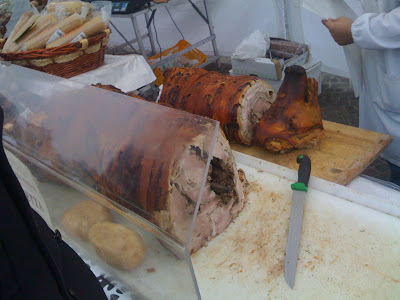 It's a whole, boned, roast pig stuffed with herbs and it is the best bit of pork I've ever eaten in my life. We bought about €15 of it and ate it on the flight home. Recommending this is completely pointless unless you happen to be in Bologna on the occasional Sunday where the farmers market appears in the Piazza XVIII Agosto, but there it is anyway. All in perfect condition, all made from milk from one farm and one small-batch producer and all completely delicious. And I'll probably never eat any of them ever again... sigh. 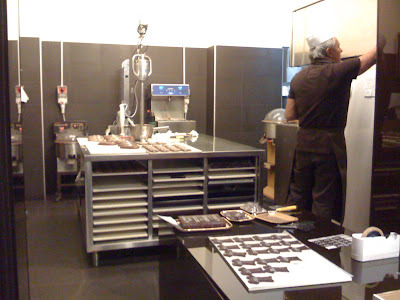 Roccati chocolate shop on a back alley near the Piazza Maggiore was a bit of a find as well. 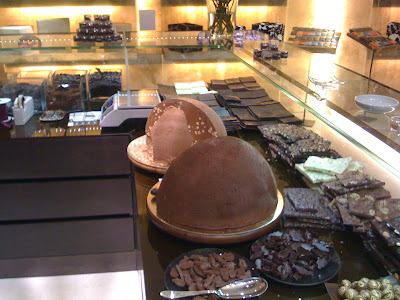 We watched the guy put together the chocolates with incredible precision at the preparation area towards the back of the store and we spent a good half hour cooing over the plates of intricate sweets and huge spheres of hazelnut nougat. Then we bought a timid amount of dark-covered almonds and a block of 100% chocolate and it cost about €30. 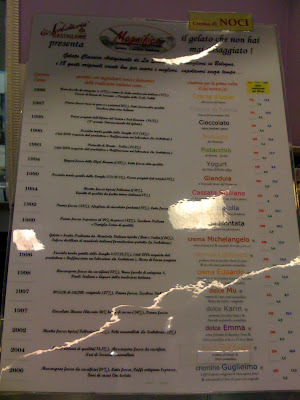 This Gelateria on the charming Via Castiglione apparently draws people from far and wide for its generous selection of ice creams and sorbets, and seems to have been doing so for a very long time, judging by the dates on the menu. My own choice was perfectly nice - caramel and custardy and fresh-tasting - but the real surprise was the price, just €1.50 for two decent-sized scoops of home-made ice cream. Which just goes to show that there are bargains to be had anywhere, and anyway, being a Londoner I can hardly hold up my home city as an example of fair pricing and generosity to tourists. What I will take away from the Bologna trip is a renewed appreciation for Italian food, memories of a fantastic long weekend in one of the most beautiful cities on earth, and a cupboard full of the finest Italian produce my crappy Pound Sterling can buy. Now that's what I call value. Saturday night, and another exhaustively researched Trattoria in a breathtakingly pretty part of Bologna. 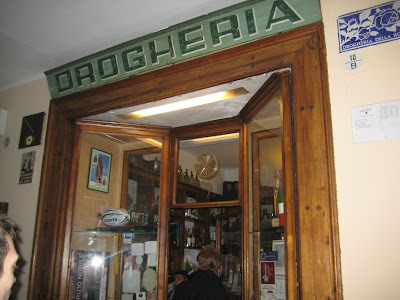 Drogheria Della Rosa is notable for two things, other than the food of course. Firstly, it's housed in an old shop, and the tables and chairs are crammed into the unlikeliest of nooks and crannies, some wildly unsuitable. We were shown to a table perched precariously close to the top of a flight of stairs in a hilariously narrow corridor to and from the busy kitchens, but we were by no means the worst off that night. One poor couple attempted to enjoy a meal in the tiny holding area where diners waited to be seated, the frigid Bologna winter air blowing in every few seconds and with excitable Italian staff arguing animatedly just above their heads. They looked thoroughly miserable. I half expected to find a table for four set up in the gents when I went for a pee. Secondly, Della Rosa is more than a little renowned for the ebullient service, thanks to the larger-than-life character of Emanuele Addone. Being a repressed, up-tight Englishman who would run a thousand miles rather than have to put up with that in-your-face TGI Friday's style false bonhomie, I was a little unsure at first, but fortunately there's nothing in the least bit forced about Sign. Addone's style and he just came across as genuinely friendly and welcoming. He also gave us a free bottle of wine to send us on our way after the meal, and how can you dislike anyone who gives you free wine? So to business. 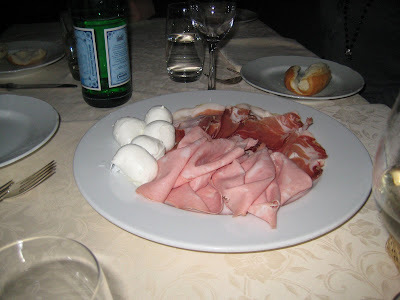 Antipasti was a plate of mortadella and Parma hams and a few fluffy little balls of buffalo mozzarella. 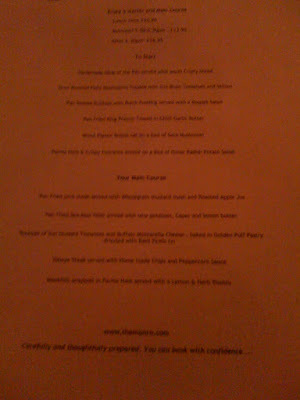 All brilliant - especially the mozzarella which were sweeter and more creamy than any I'd had before. 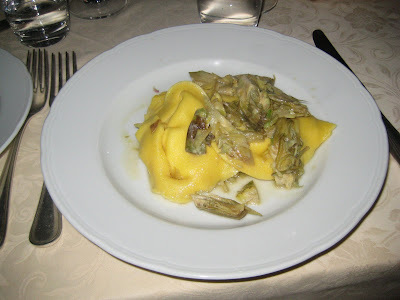 My starter of fresh artichokes and cheese-stuffed tortelloni (tortellini/tortelloni being a speciality of Bologna it seems) were stunning, the artichokes blindingly fresh and sweet and the homemade pasta silky and deep in colour from good egg yolks. This is the kind of dish you dream about eating in Italy, and now that I have I will dream about it even more. Superb. 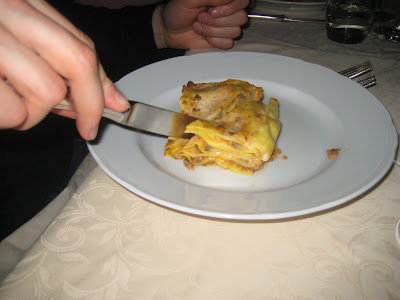 Also of note amongst the starters was a cute little lasagne with veal mince, again a big hit. My main course had a huge amount to live up to after that starter, and only just fell short. 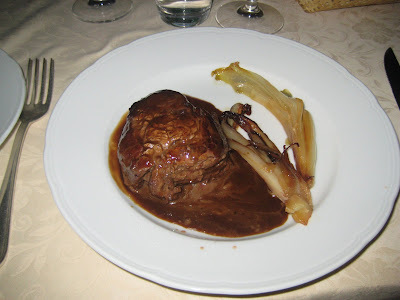 The beef jus was perfectly seasoned and the roast veg - endive I think? Or a similar bitter vegetable - were also cooked perfectly. But the meat itself wasn't of particularly high quality and despite being cooked rare was quite dry and tasteless, which was a shame. Still, another diner had the same dish and declared it the best steak he'd ever eaten, so maybe I just had the last of a poor batch. 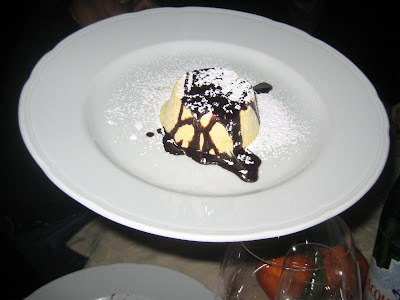 Desserts of panacotta, a fruit cake and ice cream and chocolate sauce were comforting and unpretentious, classically Italian in as far as they were simple dishes made using good ingredients and not mucked about with too much. Along with these came a huge plate of fruits and nuts - a lovely way to show off seasonal ingredients with minimum fuss, and again typical of the pride and confidence Italians have in their own produce. 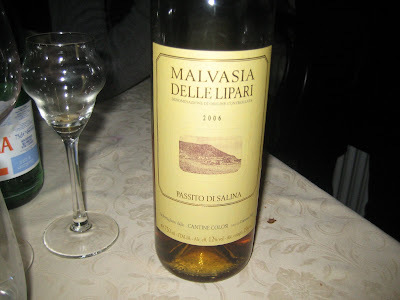 And as if all these freebies (the plate of hams and the fruit & nuts were unbilled and unannounced) wasn't enough, we were given a free bottle of delicate, caramel-y dessert wine to wash the cakes and puddings down with. 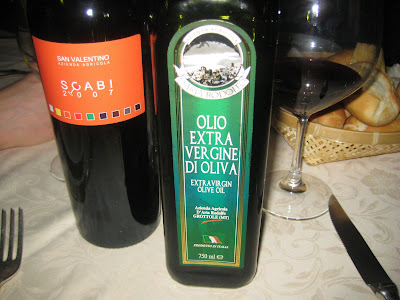 The bill came to around €40 a head, and although not super cheap thanks to the bloody awful exchange rate, it felt like a bargain once we'd polished off the free bottle of dessert wine and considered all the antipasti and other freebies. And then of course another bottle of wine was forced into our hands on the way out by Sign. Addone and all things considered it's hard to come up with a bad word to say about the place. Perhaps if I'd been sat by the front door and eaten my dinner shivering under the armpits of the waiting staff I would have come away with a different impression. Then again, if I had been served the same food, maybe not. If it sometimes seems that my life revolves around eating and eating out, and that every activity in every moment of every day is dedicated to the search for the next great meal, well that's because it is. Other people may choose their holidays based on climate, attractions or architecture, history or culture, but I have one simple rule when choosing where to spend my leisure time - is the food any good? 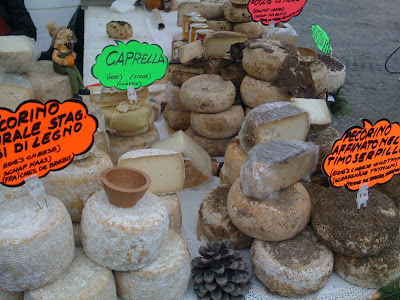 Emilia-Romagna was chosen specifically as an area of Europe that could boast a world-famous gastronomic reputation, and Bologna in particular because it had an airport I could reach in one hop from Gatwick, thus allowing us to cram in as much good eating as possible over the long weekend. 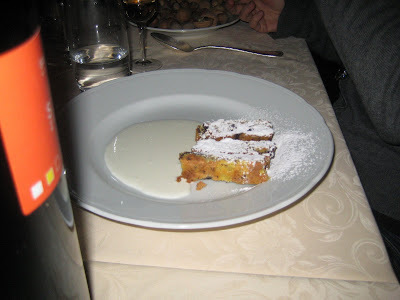 Leaving nothing to chance, I had researched two of the best trattoria in the city for our two evening meals, and through the freezing fog of Bologna last friday, made our way to Meloncello in the south-west of the city. It was, as we'd been led to expect, a cosy and unpretentious room, and the staff were merrily unconcerned with our non-existent grasp of the language. You couldn't imagine that kind of welcome in France, for example. There was no printed menu, and instead the waiter did a fine job of explaining the dishes on offer, most of which sounded relatively familiar to English ears but then maybe the point of this visit wasn't to expand our culinary horizons but to see, after all these years, how Italians cooked their own cuisine in their own country. I began with sage and butter gnocci. Fluffy, fresh gnocci and just the right amount of sage. There's not really any more to say - it was a lovely little plate of food, as tasty as it was straightforward. Another primo of genuine Bolognese ragù sat on a bed of perfectly al dente pasta and was even better. 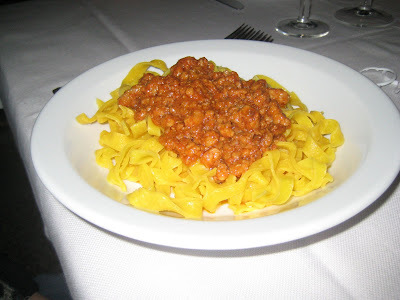 It was apparently veal mince that they used in the ragù, which gave the sauce an extra meaty silkiness. 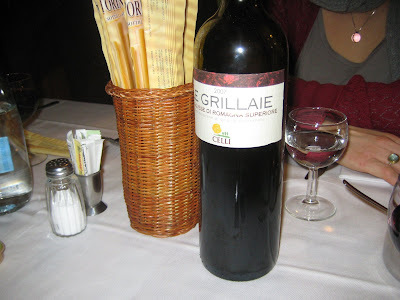 I should also mention at this point the house wine, a Sangiovese (the same grape they use to make Chianti) which, whether it was the situation or the anticipation, seemed to punch far above its €20 price tag. I have been scouring the internet for suppliers in London since. 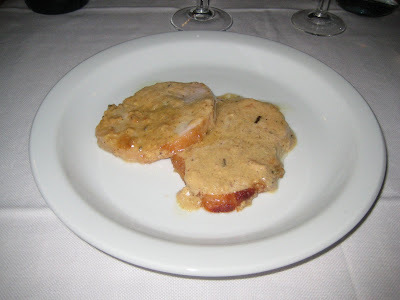 My main was a couple of slices of tender pork loin dressed in a creamy herb sauce, and was also delicious. Again, a simple and unpretentious presentation and nice enough on their own, but they were served with an extraordinary side of rosemary potatoes roasted in some sort of rich animal fat that we couldn't quite place - perhaps goose fat. They didn't last long, and neither did the pork. Desserts were varied but of the same home-made style. 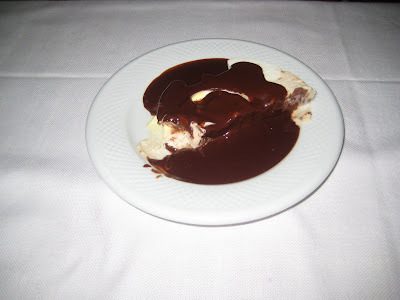 Cakes and puddings, a rich creamy home-made ice-cream dressed in chocolate sauce, nothing unusual but all prepared to a very high standard and all very tasty. 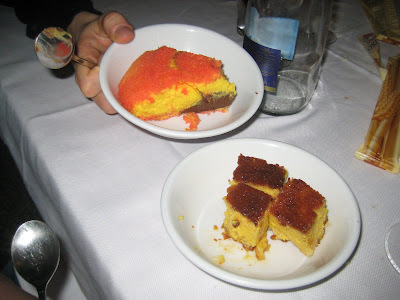 I tried bits of everything on the table (of course I did) but was so stuffed after two courses of carb-laden loveliness that in place of my own dessert I thought I'd risk asking the waiter what he suggested as a digestivo. Not understanding any of the names he rattled off, I just picked one at random that sounded something like Pedrus or Pegrus. What arrived was a shot glass full of what I can only describe as a cross between liquorish, pure ethanol and scotch bonnet chilli. The effect of drinking it, to quote Douglas Adams, was rather like having my "brains smashed out with a slice of lemon, wrapped around a large gold brick". It's the first time I've ever tasted any drink that made me want to scream out loud and then go for another sip. Quite remarkable stuff, and any Italians out there please feel free to chip in and tell me what it was, because I'm going to see if I can get hold of a bottle in London to break the ice at parties - literally and metaphorically. 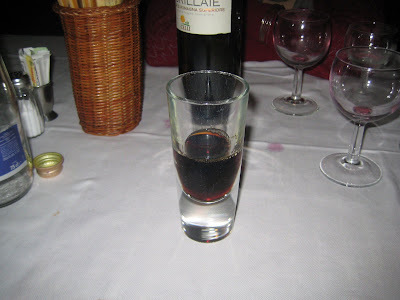 And so, warmed by the Italian firewater (or more accurately, feeling as if I'd swallowed a Molotov Cocktail and been set on fire from the inside) we headed home. 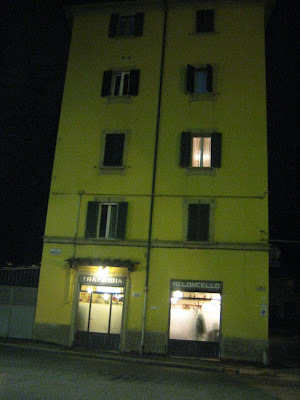 Meloncello was exactly what I was hoping for from a traditional Italian trattoria and more or less what I expected. That the cooking there perhaps verged on the side of "safe" is forgiven given the quality of the dishes they put out - after all, when safe is this good, who needs danger? I don't blame you if the scene above looks familiar. 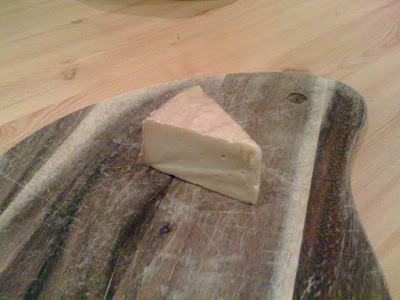 Ardrahan is a soft, pungent, washed-rind cheese and is certainly not the first of its kind on this blog. 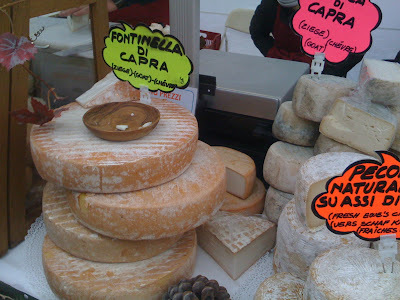 However, it is the first Cheese of the Month ever to come from Ireland, and specifically Co. Cork, which has a reputation as a culinary capital of the country and hosts the annual Taste of Cork food festival (sister event to the prestigious Taste of London in Hyde Park). If I'm perfectly honest, although I'm sure the Irish have a perfectly decent culinary heritage, I'm pretty far from an expert on it. The best I could come up with after a very unscientific poll of a few mates was Guinness, Oysters and some bar in Dublin which apparently does nice chicken wings, but that's probably more down to ignorance on our part than a lack of anything to eat over there. For someone who really does know what they're talking about, try here. 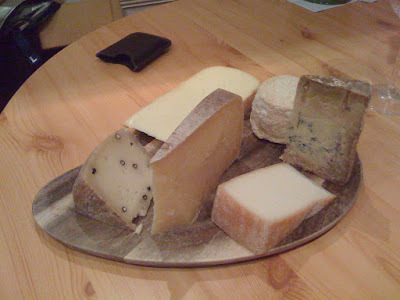 Meantime, I've got some cheese to taste. After the disappointment of last month's mail order fiasco, it was a blessed relief to be back in a proper cheese shop (Whole Foods in Kensington, whose selection seems to actually improve every time I visit, if not their service) where I could see the products up close before I handed over the cash. We had actually dropped in for some Gubbeen (a house favourite which for some reason I've never got around to reviewing) but the Ardrahan caught my eye partly for the novelty and partly because I'd had a lovely pie made out of it in the Prince of Wales in Putney last year, and if there's one thing I admire in a cheese it's versatility. 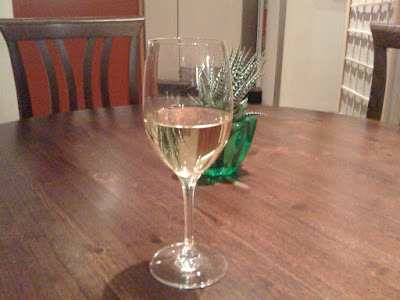 The benefit of the personal touch made itself evidence once I had unwrapped and brought it to room temperature later that evening. This is a cheese in perfect condition - glorious, billowy, bouncy flesh without a hint of chalkiness and coated in a delicate layer of sticky orange rind. 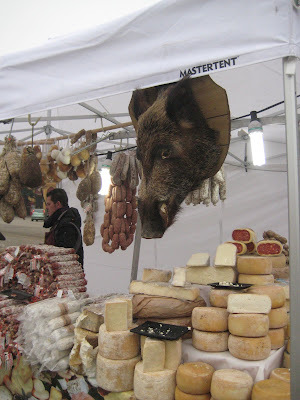 Also, like other cheeses of this kind, although it smells like something dragged up from the seventh level of hell, in the mouth the aroma is reduced and a satisfying, earthy, farmy flavour comes through. But most of all, it's the texture that I love about Ardrahan. It's firm enough to cut and display neatly on the cheeseboard but is spongy on the bite and the salty, rich flavours dissolve generously when eaten. Although Ardrahan is a safe choice in some respects - I knew I'd like it and I did - let's not pretend for a second that cheeses like this are easy to make, and I don't want anyone to think I'm getting blasé about yet another washed rind cheese being nice to eat. Ardrahan, like Stinking Bishop, has been produced by one family for the last fifteen years, from a small herd of specifically bred cattle, and a tight rein is kept over quality control at every stage of the process. The Burns family, at their farm in Kanturk, Co. Cork, clearly make cheeses because they love making cheeses, and the fact that the product available in your local cheese shop is a triumph is most definitely not an accident - it's the result of years and years of hard graft and attention to detail. So well done them, and lucky, lucky us. It is perhaps a sign of these credit-crunchy times that, for me at least, 2008 was not quite as chock-full of Michelin starred, multi-course blowouts as 2007. And when I did occasionally push the boat out, results were mixed to say the least. 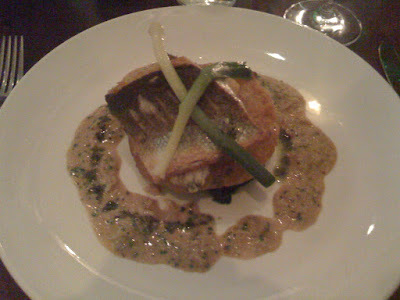 Under the "disappointing and expensive" category are Texture, Quo Vadis, St John, Le Bouchon Breton and Andaman, all of which managed to present a bill of at least £70 a head and serve food which although not exactly bad came far short of being value for money. Only one fine dining restaurant - The Square, in Mayfair - do I consider worthy of the stratospheric prices they charge, and I hope to goodness that they steer a course through the tricky economic waters of 2009 as I intend to visit again as soon as my bank balance allows it. As for the others, well, we may be about to see a kind of culinary Darwinism at work. I would keep a close eye on some of those names above and see how many are here in twelve months time. 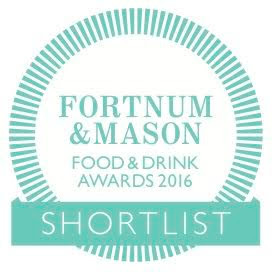 But I am not going to make The Square my Restaurant of the Year. Yes, it's served three of the best meals I've ever eaten, with dishes so perfectly judged in terms of presentation and taste that they can scarcely be bettered in the country, but at £100 a head that's exactly what you'd expect. Likewise Hawksmoor, which dishes out beautifully cooked steaks and wonderful cocktails and has become almost a second home for me in the last few months, but again you would damn well hope so too at £30 a plate, plus extra for chips. The Square and Hawksmoor have hit just the right point on the value for money graph and I'm quite happy for them, but perhaps a truly great restaurant needs something more - not just an ability to meet expectations but smash them into a billion pieces, and not just once or occasionally but again and again and again. And with that in mind, there could only ever really be one winner. I have in the past moaned about the queues at Tayyab's, even going so far as to suggest an alternative to the daily scrum on Fieldgate Street. The crowds start congregating around 6pm, and by 7:30 or so they snake around the inside of the restaurant, past the sweet counter and back again and sometimes even out into the street, hundreds strong, day after day. And if you have to ask what restaurant in the world can possibly deserve this kind of fanatical devotion, then you haven't eaten there. Juicy, spicy seekh kebabs; sizzling hot platters of bright red lamb chops coated in addictive tandoori spicing that stain your hands for hours afterwards; masala fish which manages to be crispy on the outside and fluffy and moist inside, the robust spicing never overpowering the tilapia meat itself; and dry meat - oh, the dry meat. A heavenly concoction of spices and stock, reduced for so long it's become almost a concentrated meat purée, and yet containing chunks of miraculously tender lamb, the Tayyab's dry meat is a monumental achievement. It is also, as far as I am aware, unique to this restaurant. "Tayyab's is living proof that God loves us and wants us to be happy"
Looking forward to 2009, there are no prizes of any kind for guessing what I'm expecting this year's highlight to be. I'm afraid there are no available spaces for the trip to El Bulli in September, but rest assured I will write it all up in as much detail as circumstances allow, and I'll be thinking of everyone who didn't win the email lottery as I tuck into my spherical olives. I also promise to not be too smug and keep going on about it. After nearly two years, 124 entries and over 100 restaurant reviews, it appears we may finally have a scoop on our hands here at Cheese and Biscuits. 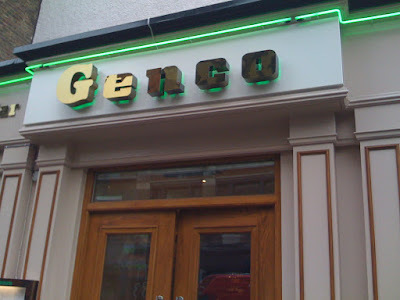 A quick Google for 'Genco restaurant London' brings up an Athens-based import company, a barbers and a male grooming specialist, but no Mediterranean restaurant in Shoreditch. So, you heard it here first, unless Dos Hermanos manage to post a review in the next few hours, and I wouldn't put it past them. With brand-new fittings and fixtures, a light and airy dining room and a decent spot on busy Curtain Road, Genco certainly has had a lot of capital lavished on it, and much of it to good effect. Tables and chairs are comfortable and classy, there is a silent Laurel and Hardy film projected onto one wall, which is a nice touch, and the service was smart and efficient and very friendly. These are all good things. They spoiled the atmosphere slightly by playing extremely loud 80s pop hits (think the Bangles followed by George Michael) throughout our lunch, but as we were the only people eating today they probably needed to get background noise from somewhere. A few seeds of doubt were sown by the menu, which calls itself "Mediterranean", as if that really means anything, and yet seems largely Turkish. Turkish, that is, if you ignore the Full English and smoked salmon baguette and chips from the breakfast menu. Fearful I might have wandered into another Bogayo (attempt a dish from every different country and cuisine in the world, and cook them all equally poorly), I was happy to see the lunch and dinner menus containing more authentic dishes and was very reasonably priced at £9 or so for a starter and main. My "Pacanga boregi" were at least fresh and light and cooked to order, but were only really just above the level of chain bar mezze. 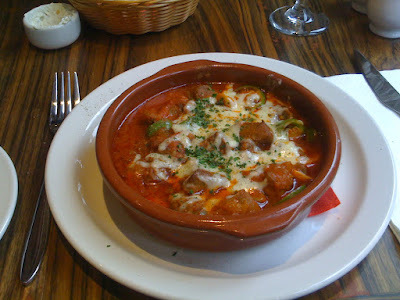 A main course bowl of "Kuzu guvec" was kind of a tomato lamb casserole with cheese, using good tomatoes and tender chunks of lamb, again hardly earth-shattering. 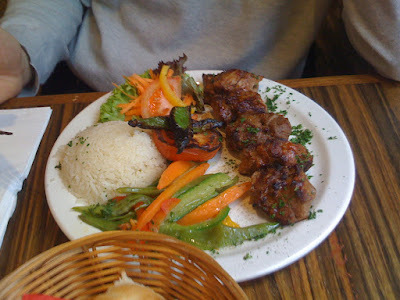 Better was a friend's "Kuzu sis", with huge chunks of gorgeously charcoal-grilled meat, which went down very well. But we are still essentially talking about a kebab, on a plate. Haute cuisine it ain't. 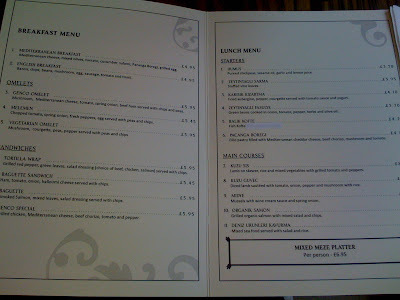 But then of course, at £17 for a hearty lunch for two, you can't, and we didn't, expect haute cuisine. 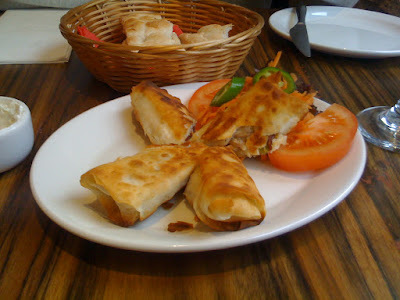 Genco is a very reasonably priced, comfortable spot for a bit of grilled meat of a lunchtime and for all my creeping disappointment about the level of ambition of the kitchen, there is always a place in the world for an unassuming, straightforward Turkish restaurant. 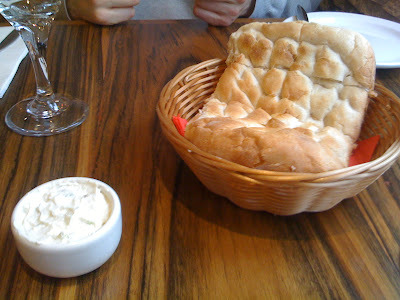 But is it too much to hope for that one day I will eat at a Turkish restaurant in London that exceeds my expectations? Time will tell, I suppose. It should be a source of great pride to Liverpudlians that the restaurant scene in this city is rapidly growing into one of the most exciting and varied to be found anywhere outside London. 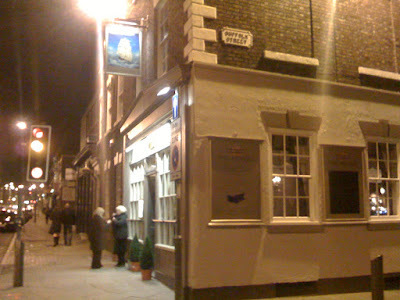 While the London Carriage Works, 60 Hope Street and (to a lesser extent) the Panoramic continue to impress at the top end of the scale, it is the emergence of bistros such as Candice Fonseca's Delifonseca and the excellent Keralan Maharaja (the Kastoori of the North West) that demonstrate a city genuinely maturing as a culinary destination. And to anyone who thinks these developments are simply the inevitable and passive by-product of a countrywide post-Jamie change in attitudes to eating, I present as evidence Manchester, which despite being arguably a wealthier and more developed city can hardly boast more than a tiny handful of decent eateries. It comes to something where a branch of Simply Heathcotes is the best place in town to eat, and yet you really can't do much better in Manchester, even in Chinatown, although to be fair there's supposed to be quite a nice restaurant in the Urbis building which I'm sure I'll get around to trying out one day. And there's another huge advantage that restaurants in Liverpool have over their rivals from around the country - a glorious legacy of buildings to house them in. It's hard to say whether 60 Hope Street would be as popular if it wasn't set in a handsome 18th century townhouse, or where the Panoramic would be without its spot on the 34th floor of the West Tower, but opening a new restaurant in an immaculately restored coaching inn in the Georgian Quarter means you can impress even before guests step through the front door. Of course, the mark of a great restaurant is one that continues to impress once the food starts arriving, and the Monro managed to impress on almost every level. I'm sure you're tired of me apologising for my crappy iPhone pictures by now, but I will just say in my defence that although we remembered to bring up a proper cameraphone from London we didn't remember to bring a power cable, so it sat in the flat uselessly for two weeks and I had to make do with Blur-o-vision© instead. Still, you'll get the idea. After choosing a lovely bottle of house wine from the largely organic list (so unusual in this part of the country to be a talking point in itself), we settled down to eat. 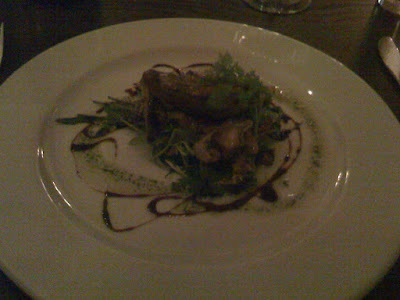 It is a mark of how rapidly restaurants in Liverpool have improved in recent years that I was imagining my "Wood pigeon breast set on a bed of wild mushrooms" as a cold and disappointing chunk of overcooked bird, and was therefore delighted to be presented with a warm, perfectly freshly cooked fillet sat atop an earthy and satisfying wild mushroom and pesto salad. You can probably even tell through the murk of my iPhone camera lens that this was an attractive dish, and I can assure you it tasted as good as it looked. Normally steak and chips would be way down on my list of priorities for anywhere other than Hawksmoor, and to be honest the only reason I went for it on this occasion was because there was no supplement and it just came as part of the set menu. 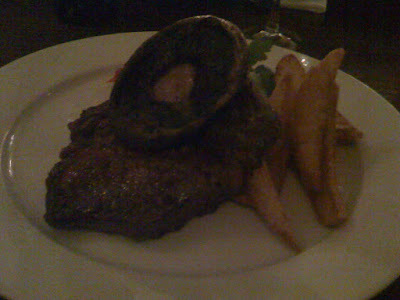 Again, tempering my expectation with memories of the Ghosts of Liverpool Dining Past, I was nothing short of stunned to receive not only gorgeous, fluffy, golden home made chips and a bucketload of creamy peppercorn sauce but a perfectly medium-rare steak of clearly very respectable provenance. Shot through with just enough succulent fat and seasoned correctly, it was precisely how steak and chips should be. I could have eaten about five. 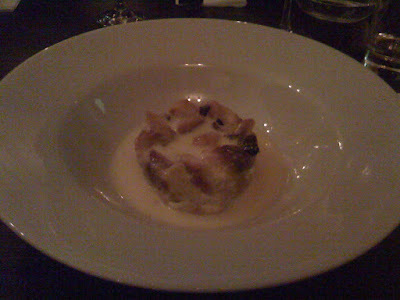 And then finally, nestled cutely in the bottom of a bowl in a lake of frothy custard, came bread and butter pudding, lovely and rich and with a very good balance of flavours and textures. Bread and butter pudding can be delicious when done well, but so often are either sickly and sweet with too much sugar or cloying and stodgy with not enough liquid. This was a fine example, and disappeared quickly. 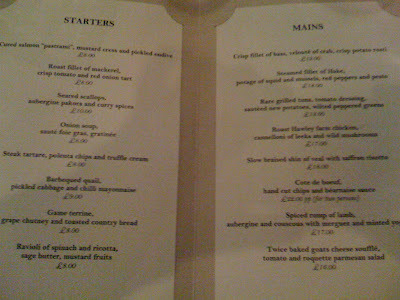 The arrival of the bill demonstrated another compelling reason to dine out in this city - those three generous courses, cooked with care and delivered with grace and efficiency, came to around £20 a head. A pittance, and yet if we'd arrived just an hour earlier we could have had the same for a ludicrous £12.95. How they can be making a profit while including that lovely steak (which on its own would have cost about £20 in a London gastropub) is a mystery, and yet is by no means unique amongst restaurants in Liverpool - the generosity of the city goes well beyond £1 a pint nights in the Globe pub. The Monro appears to have suddenly turned itself into a "proper" (ie. London-style) gastropub after by all accounts being rather mediocre for a number of years, without allowing their prices to climb and without any creeping stuffiness in service or presentation. It seems a recent refurbishment was more than cosmetic, and perhaps also the appearance of the other fine-dining spots has meant the old guard has to up their game. 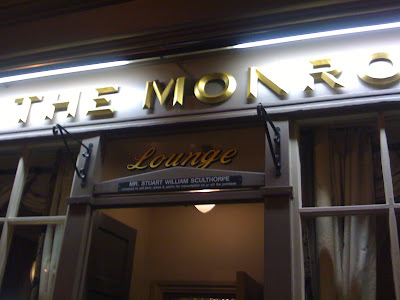 Whatever the reasons, the Monro is not just "good for Liverpool", and not even just "good for outside London". It's good. It's very good.